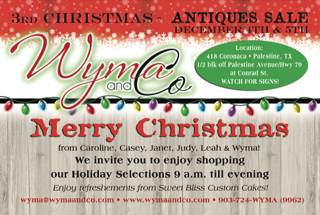 Wyma & Co is decorated for Christmas. Visit us this weekend for a Very Merry Christmas early shopping experience. Janet has out done herself with her handmade heirloom Santa's, ornaments and lovely Christmas signs. Casey has her one-of-a-kind hand painted signs and is taking orders, and Leah has made the most delicious cupcakes. Wyma has pulled out the Vintage Christmas decorations including some Dickens Villages, Byers Collection and Annalee's.